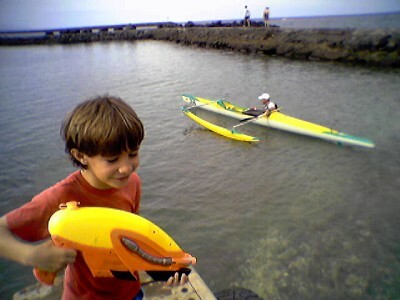 Before the start of canoe races at Kawaihae Harbor. There were some kids running around with water guns, loaded with salt water, I narrowly missed getting hit a few times. A cellphone camera image. Maybe more images later today to make up for the two days I missed. Overcast and cool weather in South Kohala with a northwest ocean breeze. Snow on the summits of Mauna Kea and Mauna Loa make for a beautiful sight, photos TK.